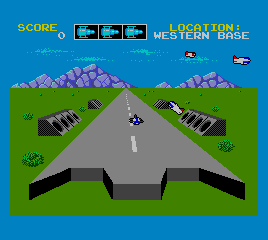 Missile Defense 3-D © 1987 Sega Enterprises, Limited. War has been declared between two super powers. At play are real nuclear missiles and the outcome looks dim. If their missiles make contact, there's no chance of survival. Luckily there's hope: You and The Eliminator, the only anti-nuclear laser in operation. Aboard a fugitive space station, you're armed for intervention and your mission is clear: Stop all nuclear missiles. But it won't be easy, Because those missiles are being launched at you too, so play for keeps, because this is the most important challenge you may ever face. This game uses both the Sega Light Phaser and the SegaScope 3D Glasses.